Use your mobile or tablet to get casino bonuses and casino rewards at UK Casino Mobile. The slick and stylish mobile casino site allows you to browse and play slots, Blackjack and Roulette on the go. There’s a £10 no deposit offer to try it out risk-free, just tap the link below to register an account. All new customers that verify their ID with a valid credit/debit card can claim the £10 no deposit casino bonus. Then when you decide to play with real money, there’s a fantastic online casino bonus up for grabs. Simply pay in a minimum of £10 and your first deposit will be given a 100% cash match, up to a whopping £500 in free casino money. UK Casino is licensed by the UK Gambling Commission and complies with the regulations set out by the governing body. This enables you to use the mobile site to play casino online from anywhere inside the United Kingdom. It works on all modern Windows, Blackberry, Android and iOS devices. So long as there’s a reliable WiFi or mobile internet connection, you’ll be able to play the mobile games. What we’re looking at here is a mobile optimised version of the internet casino. So if you’re familiar with the desktop site, you should have no trouble finding your way around. It has the same dark blue background with white and gold highlights and text. All in all it’s a professional looking mobile casino that has a more serious tone than sum of the more quirky alternatives. Navigation is made easy with a header bar that remains in view as you scroll. To the left of this, you’ll see a menu button. Clicking here gives you access to a test search function along with quick links to Home, Games, Promotions and Support. The UK Casino logo doubles as a ‘home’ button and your account balance will be shown on the right when logged in. The top of the games lobby features an advertising area for new customer offers and casino promotions. Below this a slider menu allows you to filter games by the following categories; Featured, Slots, Table and Jackpots. Each of these sections can be sorted either alphabetically or by recommendation. One slight criticism is that the slider menu disappears out of view when you scroll down, though this is only a minor hinderance. In terms of games, it’s very much geared towards mobile slots. You’ll have access to the full suite of games here, so that’s over 70 slot games to enjoy on the move. This includes popular releases by NetEnt, Microgaming, IGT, WMS and Blueprint Gaming. 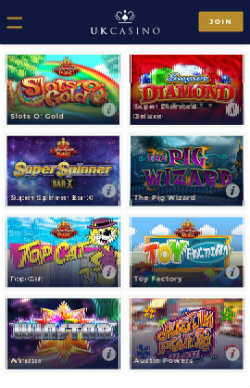 You can play video slots such as Siberian Storm, Rainbow Riches, Starburst and Theme Park. There are progressive jackpots too, including Genie Jackpots, Top Cat and Winstar. The choice of table and card games is limited to online Roulette and Blackjack. However, you can use your mobile to play live casino versions of each game, which is not something that all casinos offer. 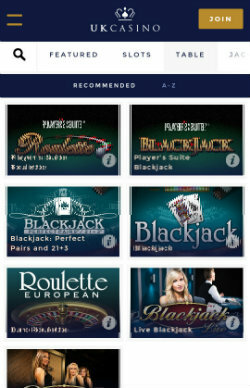 In total there are two virtual versions of Roulette and Blackjack plus Live Roulette and Live Blackjack. Playing any of the games is simply a case of tapping the image. You’ll be asked to play for real money or if you wish to use demo play. The opportunity to try out the games in free mode enables you to get a feel for each game without spending any cash. Obviously, if you wish to win money, then you’ll need to play for real. We found a few of the games to take a while to initialise but once loaded there were no glitches to report. 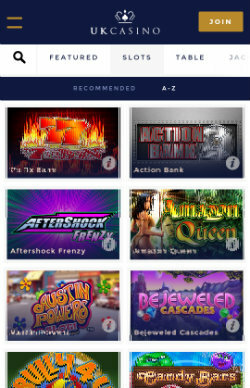 This mobile casino has three of the most popular casino game categories covered. If you like to use your mobile to play slots online, beat the dealer at Blackjack or spin the Roulette wheel, then it will be right up your street. However, there are no video poker games, supplementary table games or instant-win scratch cards. It’s great that you can access the live dealer games on the go, which gives it an edge over a lot of other mobile casinos.